The Steelers asserted their defensive dominance against Atlanta’s potent offense on Sunday. The success came from a combined effort across the board from the defensive line and the secondary. The result was limiting the Falcons to just 17 points and ringing up six sacks. 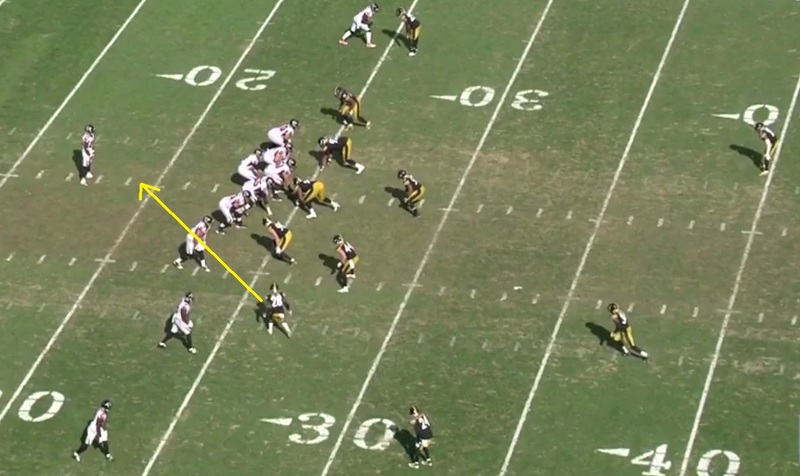 The Steelers manhandled Atlanta up front, both from a scheme and from a physical standpoint. Individual players won one-on-one matchups, Keith Butler’s blitz schemes created mis-matches, and the secondary was able to hold up long enough for pass rushers to get home. 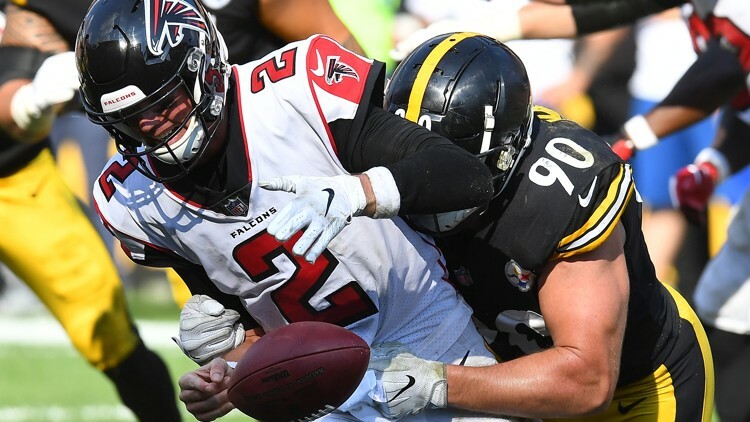 In addition to the six sacks, the Steelers were able to generate pressure on Matt Ryan on a number of other plays that forced incompletions. Here is an in-depth look at each of the Steelers six sacks. The Steelers first sack of the day came on Atlanta’s first drive. After the Steelers had scored on their opening possession but missed the extra point, Atlanta marched into Steelers territory. With a 3rd and 6 at the edge of field goal range, the defense delivered a big sack that forced the Falcons out of field goal range. This was huge for the momentum of the game not only because the defense got off the field, but because it took away a scoring opportunity. The way the play developed, it is hard to tell if this was a designed blitz or the result of good reads by the off-ball defenders. After the snap, the three receivers to Ryan’s right all release while the tight end and running back to his left stay in to block. Stephon Tuitt crashes down the line to pull in the tackle while Bud Dupree’s wide arc draws the TE and RB to block. This opens up a WIDE rushing lane for LJ Fort and Cam Sutton to run through. Both defenders are quick to react when they see the TE and RB stay in to block and make a beeline for Ryan, who just gives himself up and takes the sack. 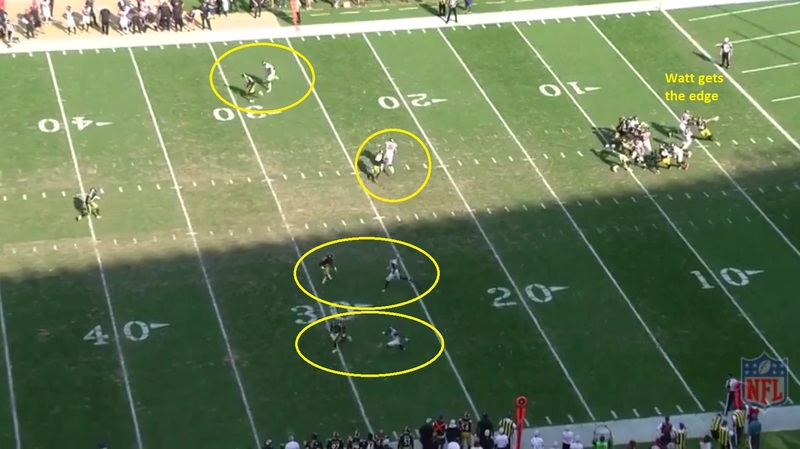 It is also worth noting that at the time of the sack, the Steelers had excellent coverage downfield. The Falcons had only 3 receivers out in the patter, and only 2 past the first down sticks. 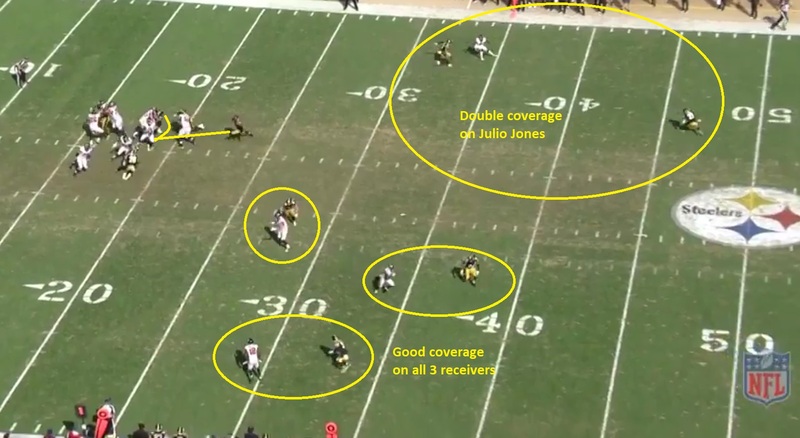 The Steelers had double-coverage on both downfield receivers and had good coverage on the third receiver, who was the outlet on the play. The Steelers turned their second drive into points as well and had a 13-0 lead at the end of the first quarter. Right before the snap, Mike Hilton crept in from his slot corner spot up next to TJ Watt and showed blitz. The Falcons were running a run-pass option play and Ryan, seeing Hilton coming off the slot, pulled the ball away from Tevin Coleman, leaving Coleman to try to block the blitzing Hilton. 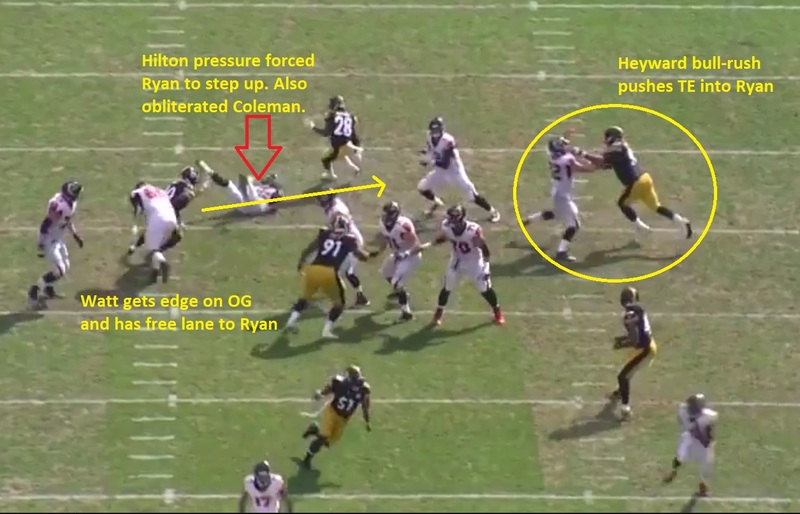 Coleman was able to get enough of Hilton to force him wide of Ryan but it forced Ryan to step up in the pocket. Since this was a run-pass option, the Falcons line was pulling to the right to follow the possible running play. The tight end from the far side was responsible for the backside contain, which just so happened to mean he was matched up 1-on-1 with Cam Heyward. As Ryan tried to elude Hilton, Cam bull-rushed through the TE. This forced Ryan to have to take a step to his right, rather than being able to step straight up into the pocket. You can clearly see this when looking at Ryan’s feet in the screenshot below. This side-step brought Ryan’s body out of throwing position. That one sideways step bought TJ Watt enough time to get around the guard and come through for the sack. Atlanta would overcome that Watt sack and wind up driving the field and scoring a touchdown to cut the lead to 13-7. After a Steelers punt, the Falcons drove back into the red zone and were looking at a first and 10 in a situation where a touchdown would have given them the lead. Atlanta ran one of their favorite plays – a play-action bootleg with Ryan. This call has Ryan running a naked boot to his left. Being a right-handed quarterback this also means that Ryan has to completely turn his body before being able to make a throw. This play was simply made by TJ Watt’s athleticism. Watt runs past both the tackle and RB Devonta Freeman, who is coming off the play-action fake and can’t get a hand on Watt to slow him down. From there, Watt has a clear path and runs down Matt Ryan from behind. This sack turned a 1st and 10 in the red zone to a 2nd and 19 at the 23 yard line. Two plays later, it was Cam Heyward’s turn. When we talk about “beating the man across from you,” this play by Heyward should be the first thing that comes to anyone’s mind. Heyward just straight-up bull rushes Pro Bowl center Alex Mack right back into Matt Ryan’s lap and pulls Ryan to the ground. There wasn’t anything special about the scheme here, it was just the Steelers best defensive player asserting his dominance. I honestly have no idea what the Falcons LG was doing on this play. The Steelers only rushed 4 and he just stood there and let Cam bull rush right over Alex Mack. This sack forced yet another field goal and enabled the Steelers to hold a 13-10 lead, rather than a 14-13 deficit. While the halftime score was tight, the big takeaway from the Steelers first half sacks is that they came at opportune times to either prevent or limit scoring chances. The Steelers were able to put two touchdowns on the board in the third quarter while stifling Atlanta’s offense to stretch the lead to 27-10. After James Conner’s second touchdown of the day, the Steelers had all the momentum. 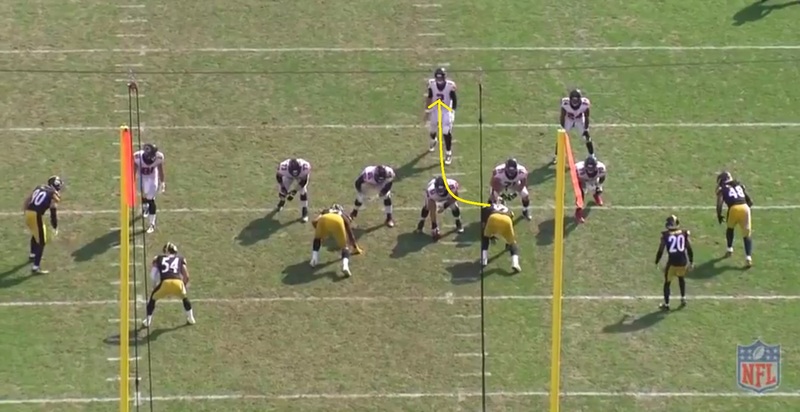 The Falcons brought their tight end in motion to have three receivers to the right of Ryan. Against Kansas City in these situations, the Steelers sat back in zone coverage and got roasted by Mahomes. This week, Keith Butler’s adjustment was to bring Mike Hilton on a slot blitz when the Falcons stacked 3 receivers to one side. 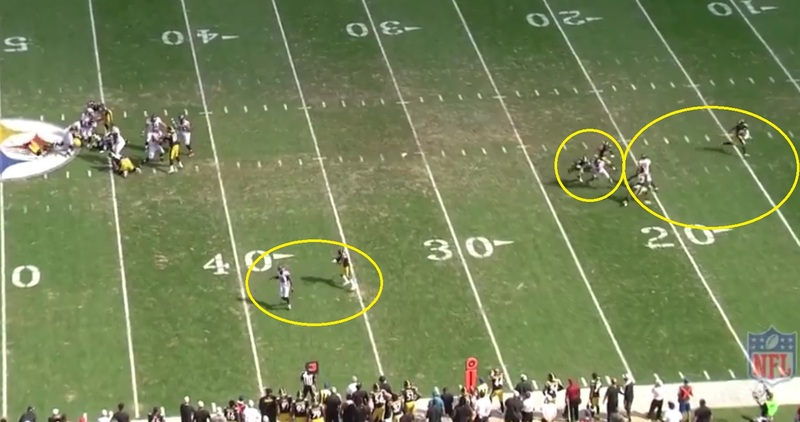 The Steelers were in a relatively simple Cover-1 defense with man coverage underneath. The coverage held up across the field. With no one open, Ryan stepped up in the pocket away from the deep push by Bud Dupree on the high side. With the running back staying in to block, Jon Bostic made a beeline for Ryan. 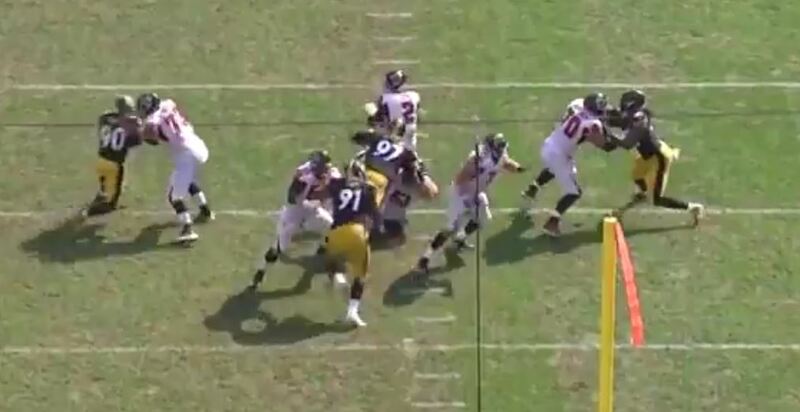 At the same time, Cam Heyward got past his block and Bostic and Heyward split the sack. This one can be rung up as a coverage sack. 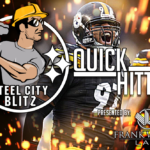 The players in the secondary did their job to take away Ryan’s options and Hilton’s blitz coupled with Cam Heyward winning another one-on-one generated the sack. Jon Bostic was flagged for unnecessary roughness here because he hurt Matt Ryan’s feelings and/or the refs wanted to keep the game close and felt bad for Atlanta. The Falcons would wind up scoring their second touchdown of the day on this drive. The Steelers responded to Atlanta’s touchdown with one of their own to keep a 17-point lead. Neither team produced points on their next drives which gave Atlanta the ball back with just under 4 minutes to go. Once again, Atlanta kept their running back in to help with the protection and both Steelers off-ball defenders came on a blitz. 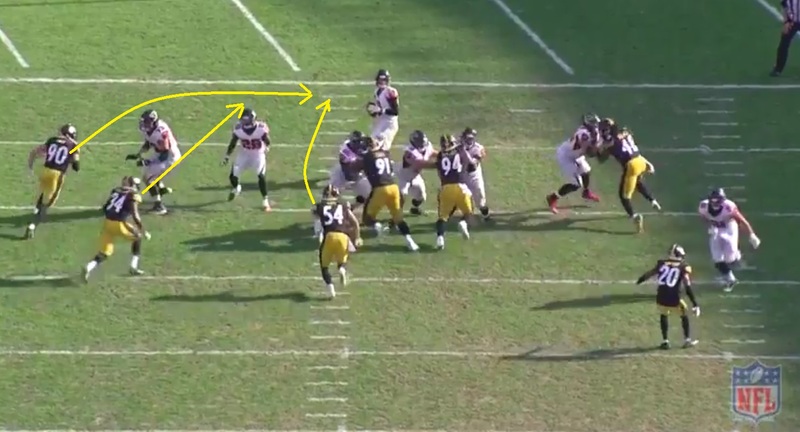 This overload created a mis-match to Ryan’s right side where the Steelers had three rushers (Watt, Edmunds, Fort) against just two blockers. TJ Watt beat the Falcons tackle around the edge and good coverage across the board in the secondary forced Ryan off his spot. As Ryan scrambled to his left, Watt caught him from behind and knocked the ball out. Bud Dupree tried to scoop and score but missed the ball, knocking it further into the end zone. LJ Fort would fall on it in the end zone for the touchdown. Atlanta pulled Matt Ryan from the game after this and replaced him with Matt Schaub. Obviously, the last sack was directly responsible for seven points in the Steelers 41-17 victory. On top of that, three of the first half sacks can also be attributed to either preventing points (knocking Atlanta out of field goal range) or limiting points (forcing a field goal instead of allowing a touchdown). Four of the Steelers six sacks had a direct impact on the final score line of the game. Keith Butler did a good job dialing up various kinds of blitzes from the slot or from off-ball defenders to make Matt Ryan uncomfortable and get him off his spot. TJ Watt is now tied for the league lead in sacks and the Steelers as a team lead the league in sacks.